Even in the summer, you sometimes feel the need for a bowl of soup. This weekend I decided to make a pot of soup using summer vegetables and herbs. It’s not a million miles from minestrone and was created with what I had available in the fridge and the garden. 4 ripe tomatoes, deseeded and chopped. 1. Heat the oil in a pan and add the onion, celery and carrots. Put the lid on, turn the heat down to medium and let the vegetables sweat for about 5 minutes. 2. Add the courgettes and tomatoes, put the lid back on for another 3 minutes. 3. Add the vegetable stock and bouquet garni and season with salt and pepper. 4. Simmer for 15 minutes then add the pasta and simmer for another 5 minutes until it is cooked. 5. Add the chopped parsley just before serving. I’m entering this recipe for Cooking with Herbs run by Karen at Lavender and Lovage. I’m also adding this to No Croutons Required. No Croutons Required is a monthly vegetarian soup and salad challenge. It’s hosted by Jac at Tinned Tomatoes and Lisa at Lisa’s Kitchen.This month Jac is hosting and the theme is ‘Seasonal’. My seasonal ingredients are courgettes, tomatoes and herbs. Gorgeous. Plus it was a little chillier today so this would have gone down very well. Love that you've included stuff from the garden too. Nice work! A lovely soup, a true essence of summer. Love this, very Italian – orzo is great in soups! I love soup and as soon as the weather cooled down it is perfect! This looks so summery and I love the color! 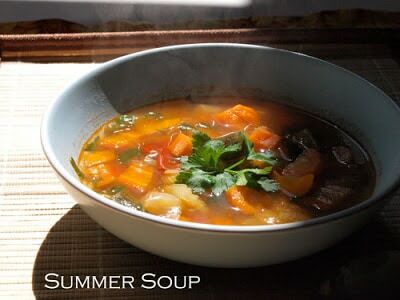 That soup looks lovley Janice and they are nice summery flavours (as well as winter ones). We've been living off courgette soup over the last few days. The glut has started.